In terms of portable electronics, tangle-free is preferred and cable-free/wireless, even more so. But when it comes to mobile devices, wireless options are still seeing the beginnings of development and are, therefore, more expensive than opting for a cabled option. Luckily, there are cables and cable management systems out there that minimize the trouble of having tangled cables. A team of two MBA graduates from Slovakia has developed the CulCharge as the newest solution in the charging cable world. 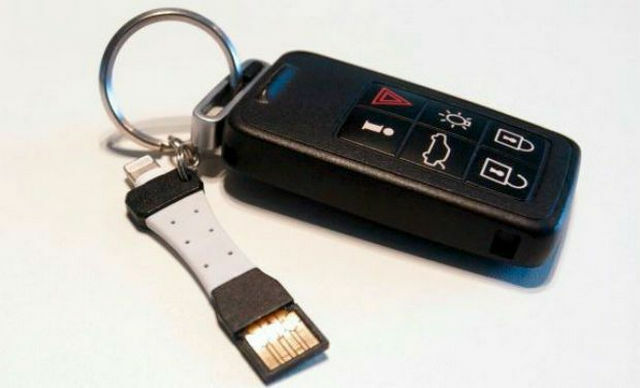 The CulCharge offers the charging ability of normal size cable USB chargers in the form of a slim and miniature device that’s small enough to be put on a keychain. The CulCharge is a USB cable that has been compacted like no other to offer extreme portability and a possible nonexistent cable entanglement issue. The USB charging cable measures 2.3 inches long only. With a cable that short, you would really have to go out of your way for a tangle. The cable is made of a flexy silicone material that allows it to be bent and twisted without worry of damaging the wires within. As a matter of fact, it allows the user to twist the cable up to 180 degrees around without damage to the device. And though more focus is being placed on its charging capabilities, the CulCharge USB cable can also be used for data transfer. The CulCharge’s hardware consists of a standard-sized USB port connector, the short flexy cable, and a port type best suited to the mobile device of your choice. To keep from closing off access to any one user, the team behind the CulCharge USB cable offers different port types for the tiny charging cable. 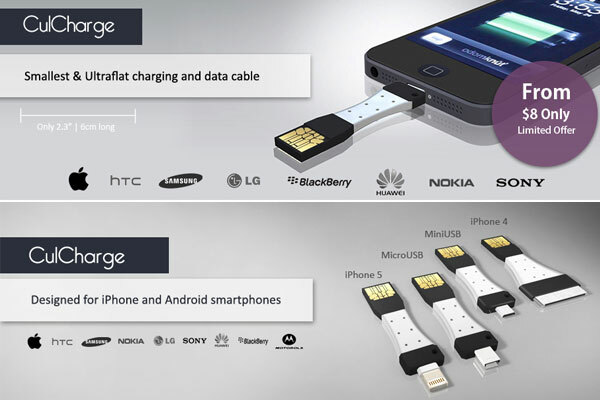 Users can pick among four different port types: lightning (for the iPhone 5 and newer Apple devices), 30-pin (for iPhone 4 and below), micro-USB, and mini-USB. From these four selections, almost any mobile device can be charged. The CulCharge USB charging cable is currently available for pre-order at Indiegogo, a funding site similar to the Kickstarter Project. If you want to see this device go into production, feel free to contribute between $8 and $15 (the price per unit) to the funding program. The campaign for the CulCharge cable has only about a month left to reach its $15,000 goal. At $14,389 raised, it’s a very close call for the ultraportable USB charging cable that you can carry around without bulk. This entry was posted in CulCharge and tagged Android, charging cable, culcharge, iPhone, usb cable, USB data cable. Bookmark the permalink.